Pt100 Class A Sensor with M12, 4-Pin Connection Allows for Quick and Easy Installation. An M12 Extension Cable is Required for Installation. 3A Approved 316L stainless steel wetted surfaces with surface finishes of 32 microinches or better. Mounting flanges are 16AMP style conforming to ASME-BPE-2007 for proper fit with CIP systems. 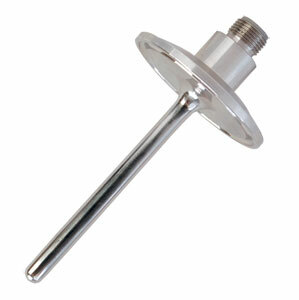 Probe designs include a 1/4" diameter standard duty and a stepped 3/16 to 3/8" heavy duty design. Standard probe lengths of 3, 4, 5 or 6" available from stock, other lengths available as special orders. Sensor is a 4-wire, 100 ohm, Class A, Platinum Pt100 RTD meeting the requirements of IEC 60751. Connection is a 4-pin M12 plug style connector. These sensors can be used with 2-wire, 3-wire or 4-wire systems see information below. Insulation resistance: 100 megohms minimum at 100 VDC. Thermal response time of less than 2.5 seconds in water flowing at 3 ft/sec (63% response). The 3-A Approved OMEGA™ PRS-S-M12 and PRS-H-M12 Series RTD Sensors are designed for use in Sanitary or Hygienic Clean-in-Place applications in the Food, Dairy, Beverage and BioPharmaceutical industries. These temperature sensors are manufactured with 316L stainless steel housings that meet the dimensional and finish requirements of 3-A Standard 74-05 and ASME BPE-2007, and are welded and processed to provide a clean, smooth, 32 microinch or better surface finish in the wetted areas for Clean-in-Place processes. The probe stems are manufactured in two configurations; with a standard ¼" diameter probe for standard duty service, and a stepped 3/8" to 3/16" diameter probe design for good response times in heavy duty applications. A 4-Pin M12 Connector provides a quick and convenient connection point for process wiring. Omega offers a full line of M12 extension and patch cables in a variety of cable materials, lengths and connector configurations. These sanitary RTD sensors are supplied standard as 4-wire assemblies with 4-pin connectors. When used in 2-wire systems, connect one wire to pins A or B and the second wire to pins C or D as shown below. This M12 connector style sensor is also available with a Thermistor sensing element in order to accommodate a wide variety of input requirements. For lengths over 24 inches, please consult sales.